The energy efficiency community is increasingly looking at efficiency programs through a new lens: equity. We ask ourselves not just how to save energy, but how to ensure that everyone has access to the cost savings and increased comfort that result from efficiency upgrades. To incorporate equity into research and program design, we need to consider location. Homes and businesses in rural areas often have unique energy needs that can make it challenging for utilities, state energy offices, nonprofits, and others to deliver energy savings. But energy efficiency can have a big impact in these communities, so ensuring that services are affordable and delivered equitably is important. In a new ACEEE report, we profile programs that have helped rural households, businesses, farmers, and municipalities reduce their energy burden — the share of income spent on utility bills— and improve their homes and buildings. We found a few interesting roadblocks and opportunities. Webinar this afternoon — register now! We identified a few common barriers, based on our interviews with utilities and their associations, state energy offices, and third-party efficiency program implementers. They found it challenging to inform rural customers about services, find trained workers locally, or do cost-effective installations, because the customers are geographically dispersed. Some cooperatives and small municipal utilities have insufficient funding and limited staff capacity to offer efficiency services. Several small utilities are investing in energy efficiency, but because they don’t collect performance data, evaluating their success can be difficult. We also found examples of efficiency programs overcoming these challenges. As an example, for the past couple of years, Efficiency Vermont has partnered with the Vermont Department of Housing and Community Development to integrate energy efficiency improvements into small town revitalization efforts. They use word-of-mouth program marketing and target select communities on a rotating basis to deliver the biggest benefits possible. A few promising trends emerged. Many of the program implementers we reviewed engage rural community partners, including community-based nonprofits or cooperative utility associations. For example, the Florida Office of Energy works with soil conservation districts to understand farmers’ growing cycles. These partnerships give program implementers valuable feedback on community members’ needs. Additionally, several programs help develop the local energy efficiency workforce. For example, Energy Trust of Oregon partners with community-based nonprofits to encourage local contractors to integrate energy efficiency into their work. To learn more about energy efficiency and local workforce development, check out our recent report. An array of generation and transmission cooperatives and utility associations help their member utilities save energy for their customers. The Arkansas Electric Cooperative Corporation and the Southern Minnesota Municipal Power Agency (SMMPA), for example, both administer efficiency programs on behalf of their member utilities. SMMPA offers programs for small businesses like the hardware store pictured below. Some state policies include smaller utilities (which often serve rural customers) in their energy-saving goals. Valley Farm and Home of Spring Valley, Minnesota, participated in SMMPA and WECC’s Be Bright Campaign. 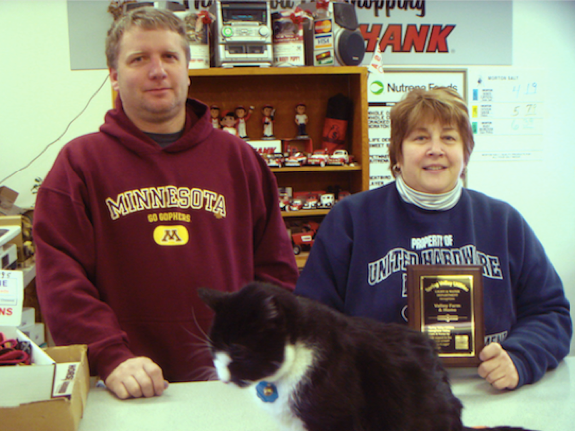 Annette Meyer, the shop owner, is pictured here with her employee Jeff Tart and her cat Furgie. Source: J. O’Neil, SMMPA. If you’d like to hear more about rural efficiency programs, please join our webinar today at 1 PM ET. We’ll discuss municipal utility-led efficiency efforts in Minnesota and rural energy equity forums in Georgia, as well as zero-energy modular homes across the country. You can continue the conversation next month at ACEEE’s first-ever Rural Energy Conference in Atlanta, Georgia, where we’ll explore efficiency program design, energy burdens, and economic development. See you in Atlanta!